At Envy Exteriors, we are a landscaping company that guarantees we can handle both of these landscaping ideas for you. With our landscaping services, we give attention to every facet when developing your landscape solution. Detailed analysis of the landscape area and consideration to your needs and preferences are meticulously examined before the foundation of your landscape is put into place. A pool can be instrumental when it comes to relaxation and peace of mind. One that’s surrounded by tranquility yet alive with the serene sounds of moving water. Imagine the soothing sounds of water spillways or beautiful rock water features. The ultimate in relaxation can be a heated spa with new massage jet technology that is now available for gunite spas. Envy Exteriors will sit down with you and establish what features your outdoor room needs to suit your lifestyle. Many homeowners have trouble deciding between a cabana, bungalow, pergola, sunroom or pool house. 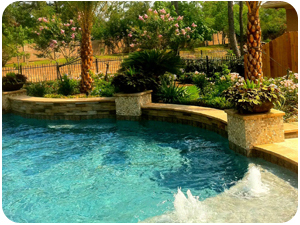 At Envy Exterior we can help walk through the entire process of developing your dream backyard.